So I find out that John Elderidge has a podcast, which is awesome. (Thank you to Suzanne for mentioning it!) I love all his books and God has really blessed me through his writing. After doing a search I find it (since I don’t use ITunes) and found a site where I could subscribe and listen to it. I am thrilled. However, on this site was an ad, a singles ad. Click on the screen shot below to see it. I nearly spewed coffee all over my keyboard! Fortunately I am not drinking coffee at the moment. This is too funny. And a little sad too. I just posted about this podcast today, along with some others I enjoy. okay, that is quite funny! I had to double take! Oh my. This is when I hate that my google ads pick up key words. I have friends in the Middle East. 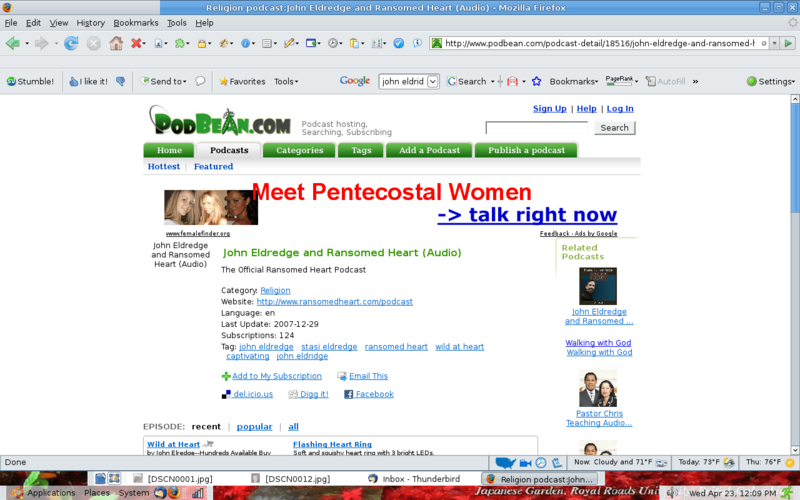 Sometimes Googles targeted ads invite me to Meet Jewish Women; other times it’s Meet Muslim Women.